On 31 March 1917, the first servicewomen of the newly formed Women’s Army Auxiliary Corps arrived in France. 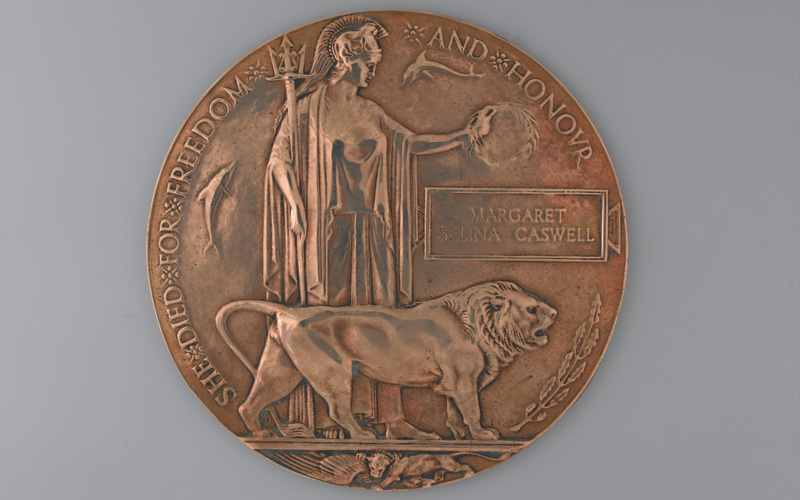 Here we display medals and other objects associated with one of these pioneers, Margaret Caswell, who helped form the basis of women’s service in the British Army. On 31 March 1917, the first group of women from the Women’s Army Auxiliary Corps (WAAC) arrived in France under the command of Assistant Controller Helen Gwynne Vaughan. Among their number was Margaret Caswell, a young volunteer eager to contribute to the war effort. The WAAC had been formed earlier that year to free up valuable and experienced soldiers for front-line service. Women were employed in a variety of jobs. As well as cooking and waiting on officers, they served as clerks, telephone operators, store-women, drivers, printers, bakers and cemetery gardeners. The WAAC had a different command structure to the rest of the army. Officers were called ‘officials’ (administrators and assistant administrators), non-commissioned officers were referred to as ‘forewomen’, and other ranks as ‘workers’. So, in name at least, the WAAC resembled the factory structure familiar to many women at home, rather than a military formation. 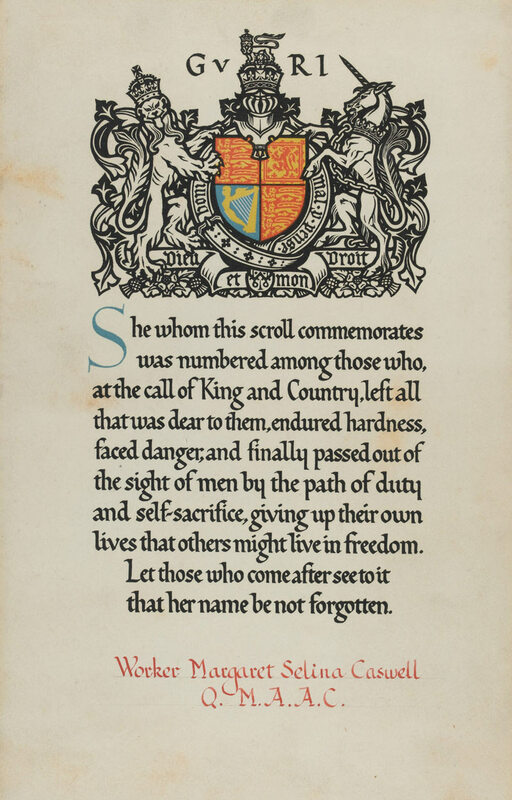 On 9 April 1918, the unit was renamed Queen Mary’s Army Auxiliary Corps (QMAAC) in honour of their work, especially their brave conduct during the German’s Spring Offensive the previous month. 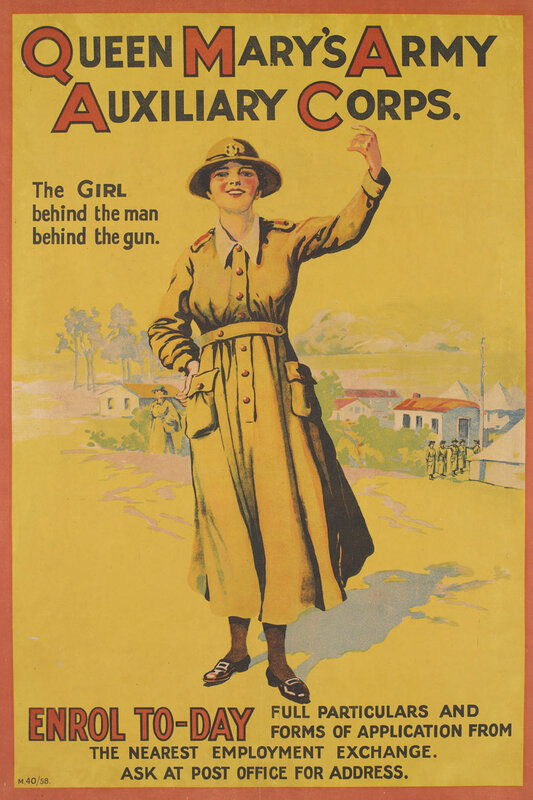 By 1918, over 50,000 women had enrolled in the QMAAC. 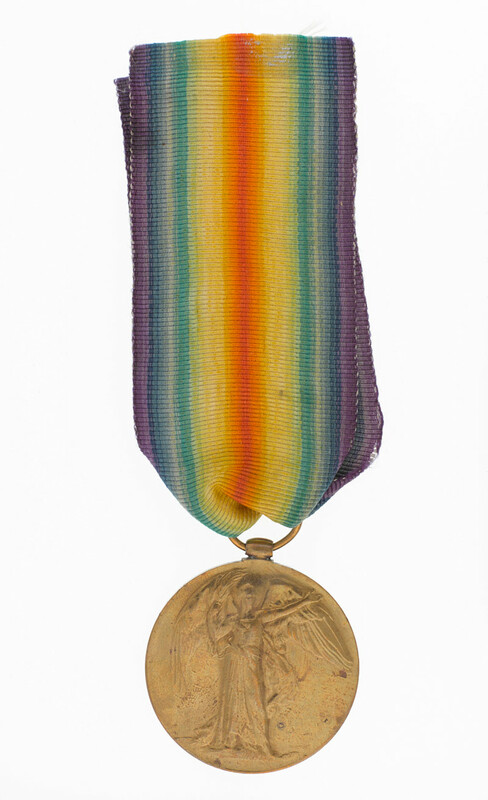 Of these, around 7,000 served on the Western Front, the rest back in the United Kingdom. Women serving in France shared the dangers of their male colleagues. Air raids on their camps and depots were frequent. 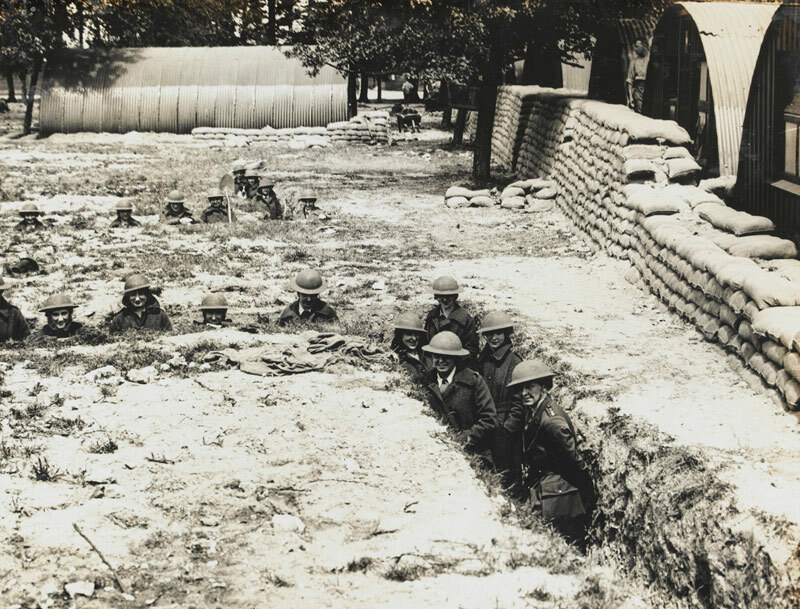 During the night of 29 May 1918, German aircraft attacked the QMAAC Camp 1 at Abbeville. One of their bombs fell on a trench shelter killing 22-year-old Margaret Caswell and eight of her colleagues, and wounding a further seven. Margaret Selina Caswell was born in 1896 at Ogbourne St George, near Marlborough in Wiltshire. She was the second of ten children of Fredrick Caswell and Mary Jane Rolfe. She grew up at 5 Lower House Cottages, Everleigh, Wiltshire. Her father worked as a farm carter. The family later moved to Hampshire, residing at Chandlers Ford in Eastleigh and then Kursley in Winchester. After leaving school in her mid-teens, Margaret assisted her mother at home. She initially enlisted in the Women’s Legion, a unit founded in August 1915 to provide cooks, waitresses and gardeners to the army. Based in Dartford, it formed the basis of a growing force that eventually also included motor transport drivers. The latter chiefly served with the Royal Flying Corps. Margaret later transferred to the Women’s Army Auxiliary Corps, enlisting at Tidworth in early 1917. Given the rank of worker, she was sent to France where she worked as a waitress at an officers’ club at Abbeville camp. 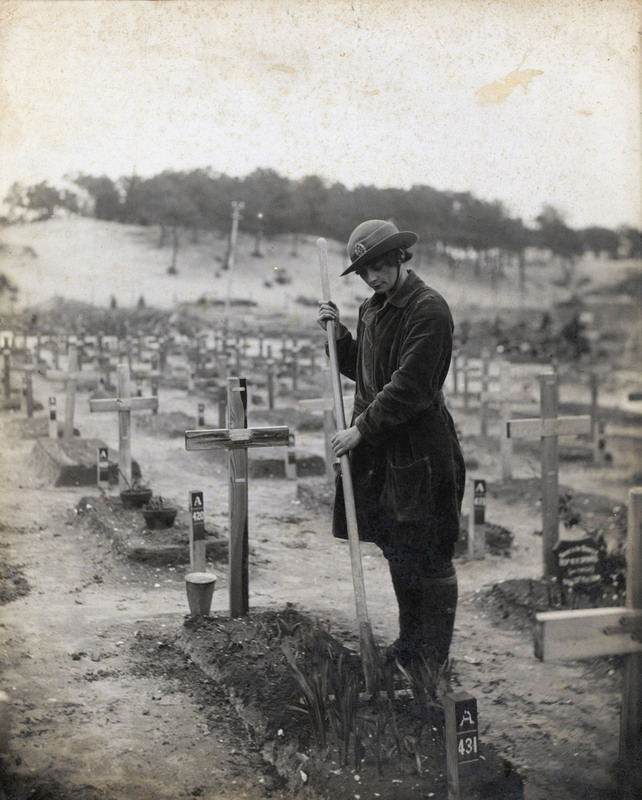 Margaret Caswell and her comrades were buried at Abbeville Communal Cemetery Extension on the Somme. She is also commemorated on the Chandlers Ford War Memorial.